What does the “New shortcut” button do? 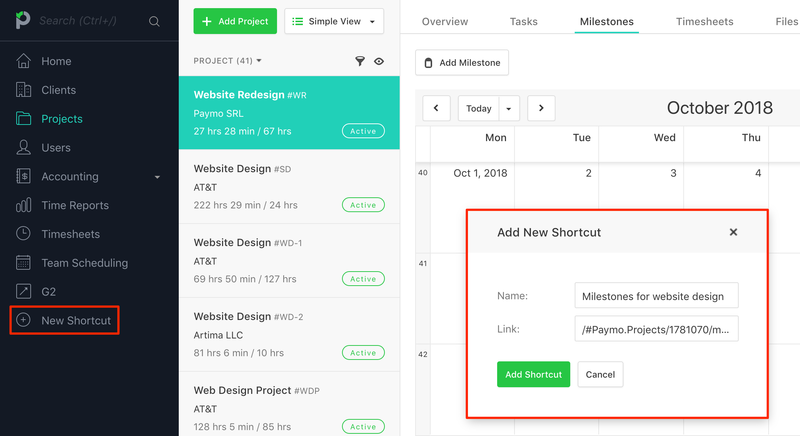 If you constantly work in certain areas of the app (for example a certain Project or a specific area of a project like Tasks or Files) you can create a shortcut to that section that will be shown in the left side menu. It will work just like creating a favorites bookmark link in your browser, but it will be placed in the the menu of Paymo. To create a shortcut you first need to go to the desired area → click on New shortcut and set a relevant name. Once the shortcut is created you will be able to quickly get to that area of the app by clicking on it. To remove a shortcut simply hover over its name and a small X icon will show up in the top right corner of the shortcut, clicking it will delete the shortcut. You can create as many shortcuts as you need.